Located on Route 58 in the Maejima section of Naha and within minutes of Kokusai Street, Tomari Wharf and Yui Rail (Naha City's monorail), Estinate is a convenient and inexpensive stop for travelers of all stripes from backpackers to businessmen. 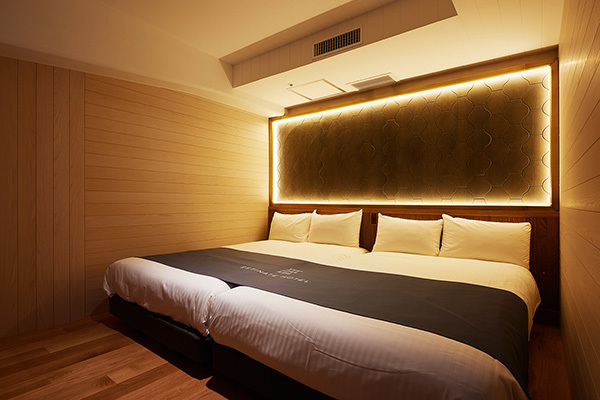 Some of the ways in which this smallish hotel differs from typical Naha offerings reflect upon a unique and refreshing philosophy toward travel and accommodation. 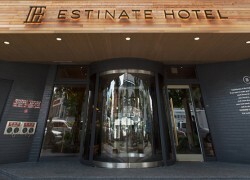 Estinate Hotel got its unique moniker through a few spelling gymnastics that modified the word "destination" into the symbol of a journey. The D was removed to show that the journey is not closed or finished, and the replacement of “-tion” with “-ate” turned the word into a verb, signifying action. In essence, to “estinate” is to meet and share experiences on a journey, which is what people do in this unique accommodation. 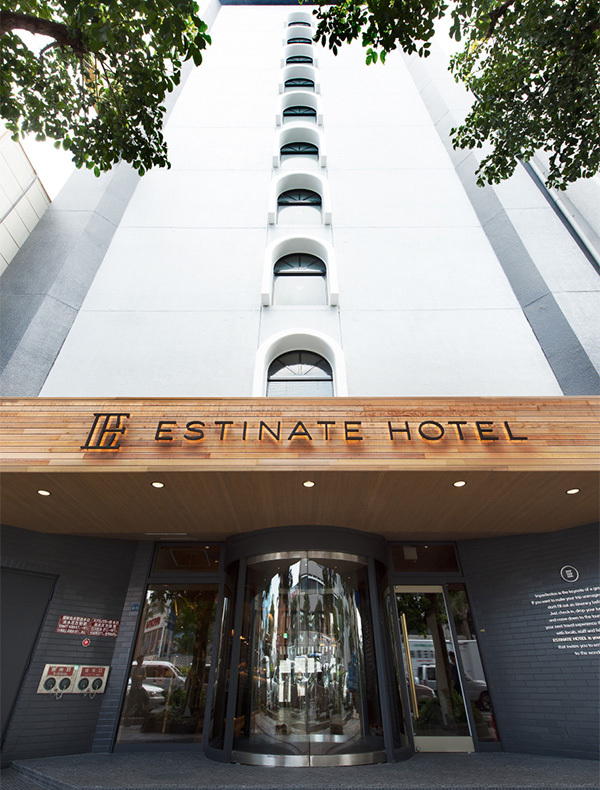 The management at Estinate calls their hotel a “social hotel.” The 88 rooms are elegant in their simplicity – the idea being that the guests in this hotel are explorers who are not in Okinawa to spend time in their rooms. Some of Estinate's unique nature is apparent right at the entrance. To begin with, almost the entire lobby area is the restaurant. The front desk doubles as the cashier, and restaurant and hotel staff share duties in taking care of customers/guests. 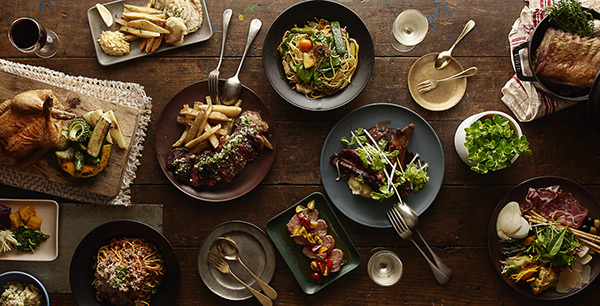 A combination of rustic wooden tables and tasteful minimalist décor serves as a simple yet elegant backdrop for a dining experience that comprises fresh meats, vegetables and pastas. 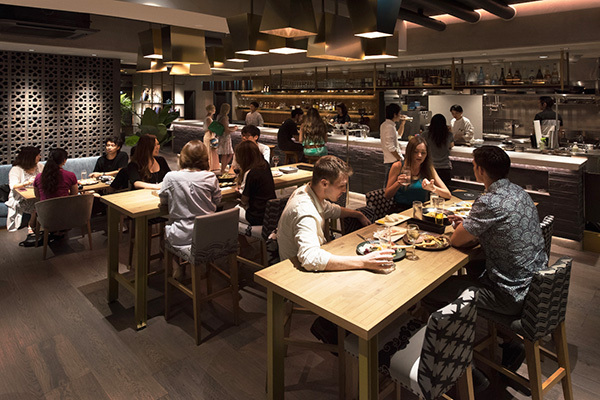 The flavors, aromas and ambiance that this gem of a restaurant projects encompass the cuisines of Europe and Asia. In this setting, where one can enjoy a meal, beer or glass of wine while surrounded by an international clientele speaking a variety of languages, the fun and romance of travel is a palpable presence. Walk a bit further through the lobby to the back door and you will step onto a wooden deck where the terrace awaits with additional seating. 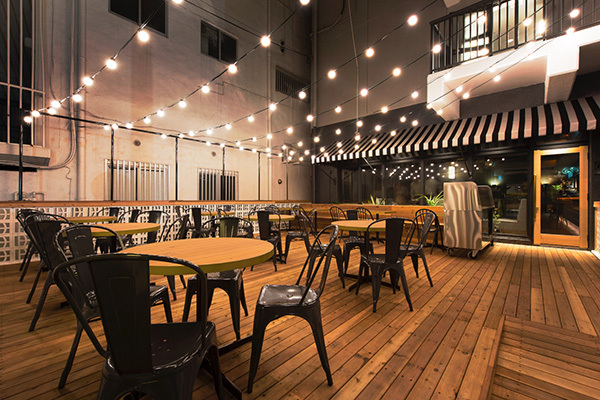 Surrounded by tall buildings under the sky and with lights strung overhead, this outdoor dining area is a charming hideaway in bustling Naha. “Here,” said Assistant Manager Kana Hamada, “is where we hold special events like the Okinawa Freaker's Marché that we had back in March.” This, according to Hamada, was a showcase of a few made-in-Okinawa “mostly food” products. Who stays at a “social hotel”? According to Hamada, there are no typical guests. “Our guests are backpackers, families, couples of all ages,” she says. “We do have many more visitors from other countries compared to a lot of other hotels – probably 70 percent of our guests are from overseas.” Of course, there is plenty of appeal to go around for local residents as well. The restaurant is a great reason for visit to this unique international setting – if only for lunch, dinner or simply drinks and conversation. Watch for Estinate's events over the coming months, including food shows, art exhibits and much more.